I was giving a talk a while back to a group of digital media entrepreneurs and practitioners at the HUBBA co-working space in Bangkok. As part of my talk, I mentioned some thinking I have been doing around education and skills. This was well received and provoked some interesting discussion, so I thought I should write it up here. This is actually based on a presentation I gave to an audience of educators at Sussex University some years ago – 2005 I think – but of course my ideas have evolved since then. I would say the thinking here is still not yet fully formed, but I think it’s worth “putting it out there”. I would welcome any feedback. 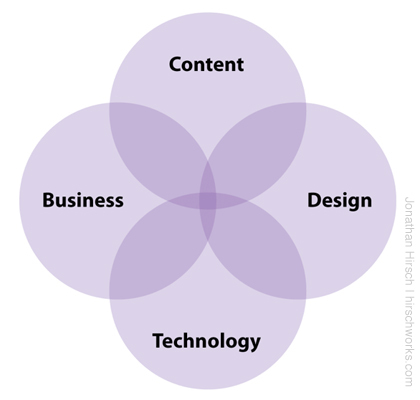 One of the characteristics of the digital media industry, particularly the practice currently known as user experience, but perhaps the wider knowledge economy also, is that it needs combinations of skills – individuals with multi-disciplinary skill sets, who are able to apply themselves broadly across diverse roles, functions and ways of thinking – and switch between them as required. Traditional specialisms are not enough. We need combinations of skills, plus certain aptitudes or attitudes, plus a broad awareness of the context in which we work – from other areas of our own industry to the wider business, economic, social, political and cultural landscape. We need individuals who can straddle business, content, design and technical disciplines. 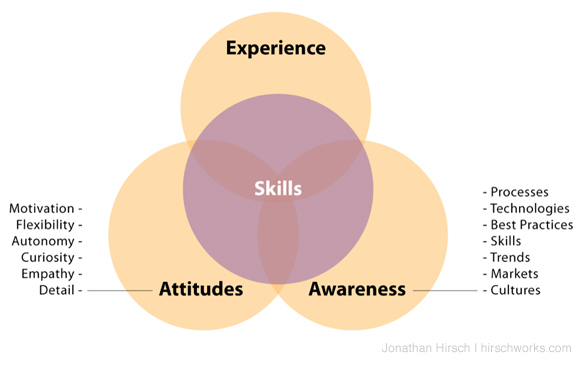 Ideally, we would have individuals whose skill set draws on all of these areas. We would have teams of multi-disciplinary individuals, rather than multi-disciplinary teams of individual specialists. But such people are rare, and we may have to settle – at least for now – for combinations of any two disciplines plus a healthy awareness of the others. But even that may be a stretch – people tend to be specialists, expert in one area, with varying degrees of awareness of the rest. 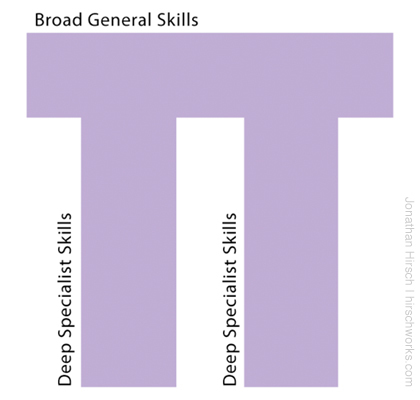 The concept of ‘T-shaped skills’ describes this idea of individuals having a deep (and by implication narrow) set of specialist skills plus a wide (but shallower) set of broad general skills. Ironically, employers will often say they need specialists – to fill a specific role. And often, the larger the company or agency, the more specialist each role will be. 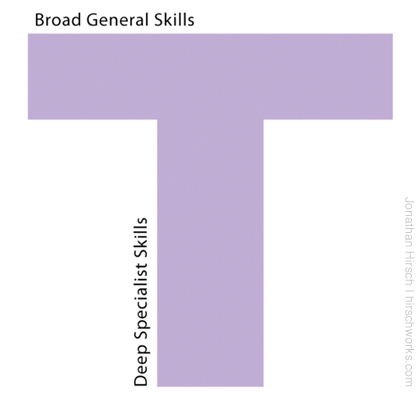 That’s fine up to a point – until that particular specialism becomes obsolete (but even before then, teams of individual specialists will not be as efficient or effective as teams of people who already understand each others’ specialisms). To have a long-term successful career, I would argue that you still need to cover multiple specialisms, even if you’re only using one of them in any particular job. You need to be adaptable. But it’s more than just skills. It’s also about experience, attitudes and awareness. It’s about being self-motivated and able to work autonomously; having empathy with those we are designing for; having the curiosity to explore and learn, and the attention to detail to deliver quality work. It’s about having a good awareness of processes, tools, technologies, skill sets and practices beyond just our own; and of keeping up to date with market, social and cultural trends. And it’s about having the experience to bring all that together, to work quickly, to solve problems, resolve issues, to know what works and what doesn’t, to recognise our own and others’ limits or those of the project parameters, to know when to push on, when to change tack, and when something is ‘good enough’ and it’s time to stop. Above all, what really matters is the mindset – being able to think in different ways, being able to understand and connect different disciplines and communicate in the different languages of each. Being able to combine creative and logical thinking, artistic flair with technical understanding, abstract ideas and real-world practicalities. Having a solid appreciation of the challenges, tasks, people and skills involved in making an idea real. And the pragmatism to work with them. We need polymaths. Engineers in the original sense. The designer-maker, the artist-scientist, the critical thinker, the enquiring mind. We need the rebirth of “Renaissance Man”. Yet such people are few and far between. The problem is that our education system seems not to be particularly good at creating polymaths. Perhaps this is because it was designed to serve the needs of an industrial revolution that happened two hundred years ago, and has yet to adapt to the needs of a knowledge economy? Perhaps it’s because of the way we separate subjects and disciplines and encourage students to specialise far too early? Perhaps it’s because of the way we assess learning? Or maybe humans are just not well suited to such a heavily knowledge-based environment? We often hear about education standards slipping – but could it be that, out of any given cohort, there will always be a certain percentage who are academically bright, and the rest who are more practically inclined, and no education system will change that? What if, in the past this was less noticeable because the majority of jobs did not require academic brilliance; whereas now, the knowledge economy has shifted the balance towards a much greater proportion of jobs requiring academic abilities? Is there anything we can do to better prepare individuals for work in a knowledge economy? 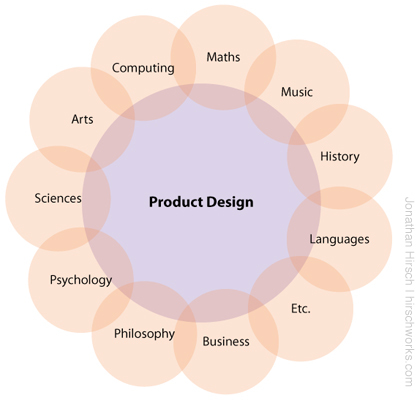 It seems to me that one approach to instilling the sort of multi-disciplinary understanding, critical thinking, and awareness of real-world practicalities that we need, would be to put product design at the heart of the school curriculum (NB that’s school, not university or college – this needs to start early), then teach other subjects holistically, rather than as separate siloed classes, pegged off the core themes of design thinking and project-based learning, using research, experimentation and exploration, underpinned by (age-appropriate) business cases. I intend to explore this more in another article. For now, I’ll just finish with a caveat. I’m not an educationalist. I’m just a practitioner who has been around the block a few times, who has seen the industry evolve, pretty much from it’s beginnings, and who has been fortunate to have had the opportunity to be involved with education and skills research and policy along the way. I don’t know whether this could work – but thoughts welcome!